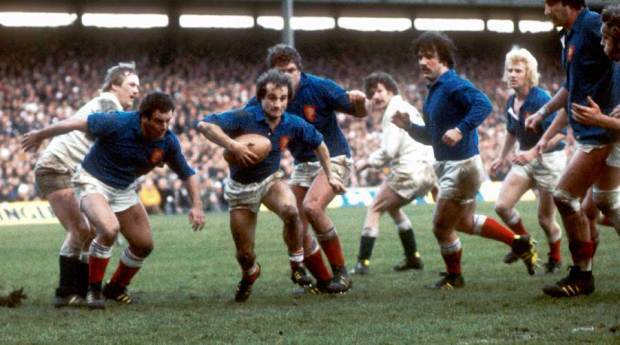 France secured the narrowest of victories at Twickenham to secure the second step of a unique Grand Slam in 1977. They used only 15 players throughout the Five Nations Championship and did not concede a single try. England proved a tough nut to crack for France, whose forwards were considered superior in size, pace and skill levels prior to the game. If Jean-Pierre Rives' blonde mane caught the eye at flanker, his colleagues Jean-Claude Skrela and Jean-Pierre Bastiat, who ran the French lineout, made up the most dangerous back row trio in the world. Giant locks, by 1970s standards, and former heavyweight boxer Gerard Cholley at prop added extra beef. French captain Jacques Fouroux acknowledged before the match, "our game with England is our match of the season. It will be our hardest game." Some praise, given that France had beaten a Welsh team to whom the rugby world doffed its collective cap at the time. Fouroux's half-back partner, Jean-Pierre Romeu was a master of his trade, his long and accurate kicking from hand enabling him to dictate where the game was played. As it turned out, Roger Uttley's England team had the better of the match in many respects. The much-vaunted French pack "were flagging on the ropes" by the end, according to Peter West in the Times. They were tamed by a forwards' performance that ensured half the England pack went on the 1977 Lions tour to New Zealand. Nigel Horton had the match of his life, particularly in the lineout against Bastiat and Imbernon. 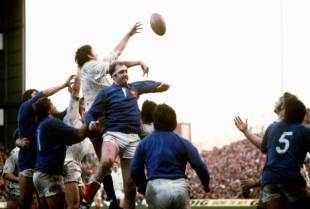 In an era when kicking to touch was much in vogue, England won 34 lineouts to France's 23. Bastiat was also muted in the loose, though his one rampage of note resulted in a broken nose for England scrum-half Malcolm Young, who was replaced by Steve Smith at half-time. Scoreless at the interval, England had failed to stretch the French defence wide enough to penetrate. Fly-half Martin Cooper's kicking from hand was too frequent and not accurate enough to seriously test French full-back Jean-Michel Aguirre. Alastair Hignell, the Cambridge student at full-back and first choice goal-kicker, had a mixed day. His tackling, fielding and line-kicking were all but flawless; his place kicking was sadly awry in the billowing Twickenham wind, no fewer than five penalty attempts at goal failing to register. England squandered their best try scoring opportunities in the second quarter. Mike Slemen and Barry Corless, breaking up the right, missed an overlap with Peter Squires free out wide. Another chance saw Slemen about to put Peter Dixon over in the corner, only for Dixon to cut back inside and be stopped by Rives. There were five scrums close to the French line, but nothing to show more than Hignell's third missed penalty. France also had chances in attack, Francois Sangalli twice threatening England's line, only to be taken down by Squires and the kamikaze work of Charles Kent. It was tremendous French tackling, however, that kept things level into the second half. The stalemate was eventually broken soon after the interval. Bill Beaumont was dispossessed in a maul, from where Fouroux dummied and fed left. Aguirre couldn't take his pass but Jean-Luc Averous picked up and fed on to Sangalli who broke the last tackle to score the first try England conceded in the season. Hignell finally found his kicking range with his fourth penalty attempt, two more going wide later, as did a drop-goal attempt by Smith. Alan Old, on the England bench, might have had more joy with the place-kicking, but tactical substitutions were not a part of the game until 1996. Peter West eulogised England's entire pack but gave highest praise to the back row: "It is difficult to conceive of such a unit playing a tighter, more effective game. There was Uttley's shrewd control at the back of the scrummage and his ball-playing skills, tidying up the lineouts. I doubt if Dixon has had a better game for England." With a bit more luck England would almost certainly have won and claimed at least a share of the championship. They had already beaten Scotland and Ireland. France's Grand Slam was secured by scoring 58 points and conceding 21. No team won a Grand Slam by scoring fewer points in the period when a try was worth four points (1972-92).